We have been working on our otter mini lops from the word go. Our foundation stock was a hodge podge of different rabbits, from different breeders. Over the years we seemed to have formed two distinct lines, which are now beginning to cross over for a more well balanced style. Titan has 14 CC's, 42 stars, Best of Breed, Best Lop, Best in Show. Great colour, short body, good ears and the ring OAP. Here is our blue otter buck Titan. He was our first rabbit to gain a Best in Show, needless to say we were overwhelmed with pride! In his day he did very well. He is now retired from show, enjoying a leisurely life and taking long romantic walks with the ladies. His progeny includes Mira and Miya. Titan is not only a looker but a sweet boy too. Always laid back, happy to receive attention and strike a pose. Mr D James: Lovely type, well proportioned, good posture, nice coat, colour and condition. In show report: Best Lop and ultimately BiS for me, a super all round ... Well done Debs and Heather. Mrs G Webb-Bailey : Nice short body, good head and ear, clean. Mrs L Keith : Blue Ott. Good head, ears and body. Nice coat and colour. Mr B Rideout : Blue otter of very short body, good skull, ear drop, chest, coat and colour. Fit. Hard lines to meet black. Mrs A Wheeler : Good colour and good head and ears fair type. D James: Grand all round type, like head and ear shape, fair coat and condition today. S Whincup- Grindey: Good coat. Good colour. Lovely head and ear drop. Just a tad more shoulder required for me. Hubble is a black otter buck out of Mira x Bubble. He is a lovely balanced rabbit, whom has made improvements on both his parents. 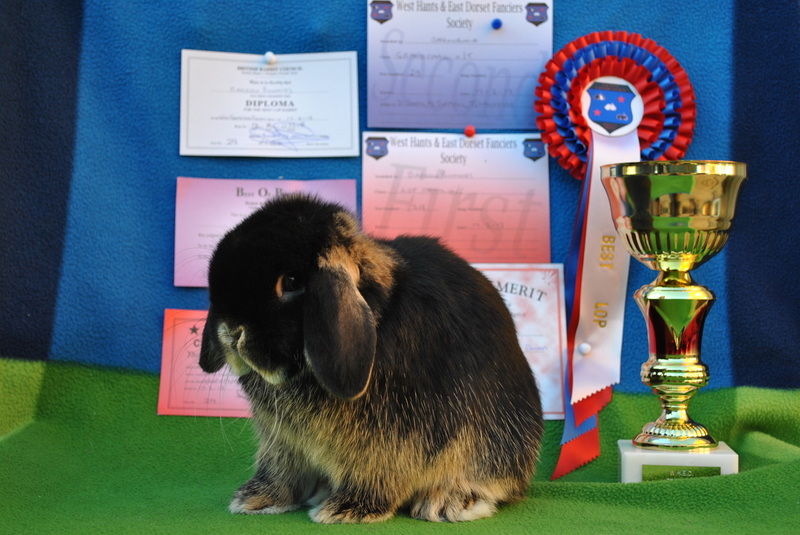 Photographed here after his first outing to a show as an under 5 with his best lop award. He is now spending time with the ladies. D James: ........ beaten on the day by a potentially very promising black otter mini lop (our Hubble) ...... Very promising good body/ shoulder, excels head and ear for age, good coat, watch white hairs! Super tanning. J Flarry: Good type and head, good colour and coat. W Brake: Wins head and ear drop, good profile and over all shape, white hairs detracted, best lop today. A young Yoshi, black otter buck out of Inca x Bumble. Yoshi matured better than we hoped and has now sired some lovely babies. Black otter doe out of Katy and Titan. She has grown into a beautiful doe, short stocky and well proportioned. ​Especially as she is now a grandmother! Jane Doe (named Jane Doe because there's a slight question mark over her paternal parentage, although we think BB's Hubble) is a lovely little doe with lovely type and coat from BB's TopFlite. ​A proven girl who produced a couple of lovely daughters we are running on. BB's Yo-Yo is a promising little buck out of BB's Yoshi & BB's Ki-Ki. We are really pleased with the outcome of this mating and feel we have achieved a lot of goals we set out to alter in our lines a couple of years ago. BB's Hebe is the chocolate self daughter of BB's Hestia (black otter) and BB's BJ (cinnamon). She has lovely type and amazing coat and colour. She could be used alongside otters or oranges.